Data in Fauna Europaea are fully expert based. The database is build from scratch by leading experts. They are critically reviewing and evaluating all available information (collections, observations, research, etc. ), not by simply merging data from available resources like faunas, monographs, checklists or collection data. For distributional details local checklists are only used selectively (when scrutinised). Furthermore, all Fauna Europaea data sets are intensively reviewed and scrutinised. During the first project phase of Fauna Europaea (2000-2004), the National Museum of Natural History in Paris was in charge for validating the delivered data sets by means of cross-checking and reviewing with existing national, regional and local resources (checklists and literature), following the criteria on data standards, data semantics, data accuracy, data reliability, and inclusiveness of data as developed for Fauna Europaea. In addition, for both offline and online data entry systems checks on the technical and logical correctness for all data entered by the taxonomic editors have been implemented as ‘Taxonomic Integrity Rules’. In order to have a better estimate of the present distribution of terrestrial species in Europe, to spread the Fauna Europaea information and share taxonomic knowledge with local specialists, regional validation workshops have been held in areas relevant for their importance in terms of species richness or endemicity. 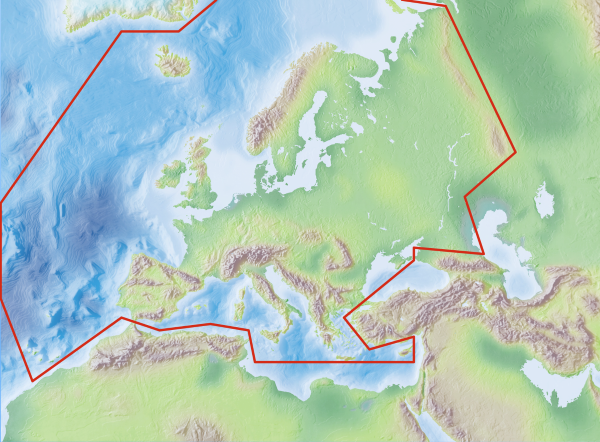 In parallel, a program was initiated on validating Fauna Europaea with help of National Focal Points, involving local taxonomic experts, cross-checking Fauna Europaea data with national species lists or other local resources. Finally, feedback was provided by users via the Fauna Europaea web form, which are forwarded to the relevant experts. Even more problematic is the nomina dubia category, that is names of "phantom species" that cannot be safely associated with any living species. Such names occur most frequently in species-rich, poorly investigated groups like parasitic wasps and spiders. Nomina dubia tend to blur the picture of known species diversity in a given geographical area. This is why the Fauna Europaea project has made substantial efforts to encourage specialists not to include any such "phantom species". All species covered by Fauna Europaea belong to Kingdom Animalia. It is important to underline that the Fauna Europaea hierarchy does not purport to be the phylogenetically “most correct” one. There is considerable disagreement between taxonomists about what is the best hierarchy, and anything like a consensus is not within view. For purely managerial purposes, however, Fauna Europaea needed to settle on one common hierarchy. Some categories (e.g. suborder, subgenus and subspecies) are not applicable to all taxa. This may be because a category may not be generally applied in the current taxonomy of the group, or because the group coordinator has chosen not to provide this information. Group coordinators and taxonomic specialists have to deliver the names according to very specific standards. The names provided by FaEu are scientific names (also known as “Latin names” although they are of Greek origin in very many cases). The scientific name of an animal species basically consists of two parts: Generic name and specific name. Each generic name requires the following information: Containing family, containing subfamily, tribe and/or subtribe (optional), author and year of publication. For a subgeneric name (located between the generic and the specific name), information about the containing genus is required. Species group names require the following information: Containing genus, containing subgenus (optional), author, year of publication, original genus, i.e., the genus in which the species was originally described, whether “Author, Year” information should be presented in parentheses or not (Y/ N). Parentheses around the author citation indicate that this was not the original taxonomic placement. For a subspecific name (appended after the specific name), information is in addition required about the containing species. Synonymy arises when different names refer to the same taxon and is a very important issue in biosystematics. One and the same taxon (genus or species) may have been described under different names by different authors (or by the same author at different times), or a name may have been wrongly applied to a taxon due to misidentification (actually a misapplied usage of a name). In many cases, different names have traditionally been used in different European countries for the same species. In other cases, some authorities regard two taxa as different species, whereas some regard them as subspecies of the same species (so conflicting taxonomic concepts). The relevance of including synonymy is not similar between all groups. Synonymy is much more important information in less well-understood groups than in the ones where the species are non-controversial. In Fauna Europaea group coordinators and taxonomic specialists have provided synonyms to very different degrees of completeness. ”True” synonyms are those that can be formally cited with authorship & date (see the FaEu Guidelines for examples). Variant spellings, unavailable names or misapplied names. Synonyms of the latter category are marked in the FaEu database with “auct.”, instead of “Author, Year” information. “auct.” is short for “auctorum”, meaning “of authors” in Latin.